Another outrage. What gall and greed. Will Congress stop this? Will you tell them to? Diane, by the way, is the one who said she would take ALL your guns, if she could. No wonder- G.M. The sale of these properties will fetch billions of dollars and a handsome 6% commission to the company handling the sales. That company belongs to a man named Richard Blum. Who is Richard Blum you ask? Why the husband of Senator Dianne Feinstein, that's who. What a bunch of crooks we have running this country! 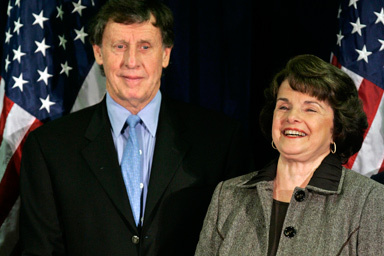 Senator Feinstein and her husband, Richard Blum, stand to make a fortune. His firm, C.R.I., is the sole real estate company offering these properties for sale. Of course, C.R.I. will be making a 6% commission on the sale of each and every one of these postal properties. All of these properties that are being sold are all fully paid for. They were purchased with U.S. taxpayers dollars, and they are owned free and clear by the U.S.P.S. The only cost to keep them is the cost to actually keep the doors open and the heat and lights on. The United States Postal Service doesn't even have to pay property taxes on these subject properties. Would you sell your house just because you couldn't afford to pay the electric bill? How does a powerful U.S. Senator from San Francisco manage to get away with such a sweet deal? A powerful United States Senator's husband is standing by, all ready to make millions from a U.S. taxpayer funded enterprise. No one in the mainstream media is even raising an eyebrow over his 6% commission on the sale of hundreds of millions of dollars worth of quasi-public assets.